This project is composed of three elements. Build the Future with 10,000 Tuvaluans- The supporting system for the activity of Tuvalu Overview. Tuvalu Mapping- over 4000 GPS photographs of Tuvalu on the Digital Globe. 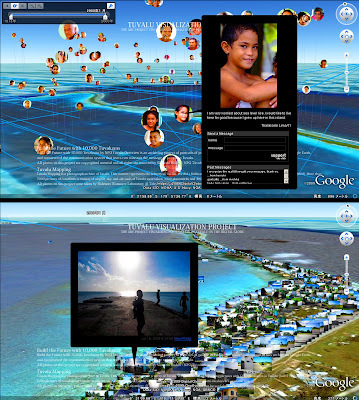 Tuvalu on Photosynth- Examples of artwork made by using GPS photographs. The purpose of project is to disclose actual information about People and Scenery in Tuvalu to the world. Therefore, we produced this project to present the real situation of Tuvalu, to improve the interest in Tuvalu, and to receive feedback from all over the world.